Well worth three minutes of your time is this video on sonic resonances in a 2D square board. As the sound wobbles the board, standing waves are set up. 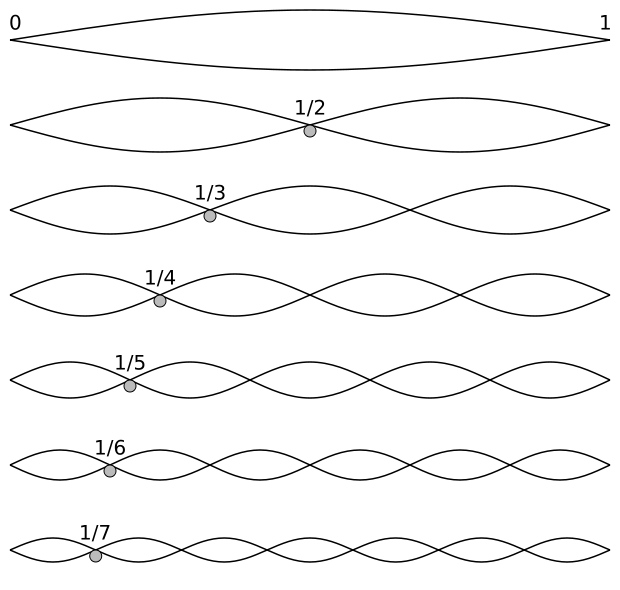 Because these waves are 2 dimensional, the resulting pattern is more intricate than for standing waves in a 1 dimensional string. The red dots are places on the string that do not move – called the nodes. For a 2D membrane, like the one above, these nodes will be lines, and salt sprinkled on the board will naturally follow these lines, since and grains not on the lines won’t sit still. As well as being rather pretty, the video shows why drums are rhythmic instruments, rather than melodic (you wouldn’t ask the drummer to drum out the melody, and drummers don’t have to worry about key changes). When you pick a guitar string, you get a note determined by the length of the string (and its tension and line density). You also get, layered on top of that note, overtones. Because the string is essentially one dimensional, these overtones are related to the fundamental tone by simple fractions. Thus, the fundamental and the overtones all sound good together – the overtones harmonize with the fundamental. (I’ve written in more detail about the musical scale here.) A skilful (bass)-guitarist can use his finger at a node to excite only these overtones, creating the so-called harmonics. Jaco Pastorius‘ “Portrait of Tracy” is the classic example, and the technique has been expanded by Victor Wooten and others. For the skin of a drum, however, there is no nice, neat relationship between the fundamental tone and the overtones. This is shown in the complexity of the patterns in the video above. The result is that there is no one pure “note” that a particular drum makes, but rather a somewhat atonal mixture of notes. Tuning a drum generally involves trying to eliminate the overtones, with the final result being a strong function of a drummer’s personal preferences about what sort of tone s/he wants. As an undergrad I remember not understanding any explanations to do with standing waves, because obviously more complicated waves could exist. Then I learned general solutions to the wave equation can be made by taking linear combinations of these, and thought that was awesome. Victor Wooten is amazing, too.